Last October, Crace was promised a peak-hour 254 bus service that would not end at Gungahlin Marketplace, but would continue on to Civic. 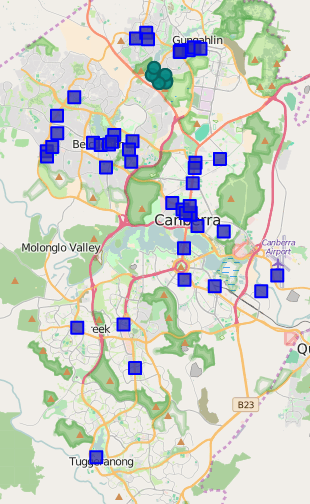 Crace is the only suburb in Gungahlin without such a service. At the eleventh hour, the bus service was postponed indefinitely. 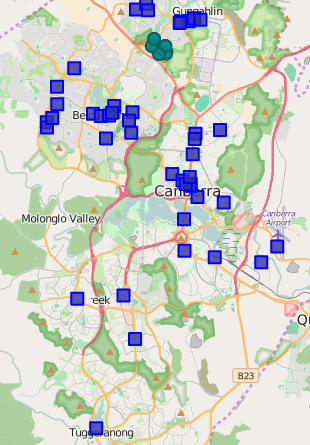 To see how Crace was impacted by this, I sought out travel data from ACTION’s MyWay system. After a few delays, I received the above map showing all travel from Crace from 7am to 9am on a given day. The green dots represent people boarding in Crace and the blue dots represent where passengers finished their journeys. I was hoping to get data to support a request to skip the Marketplace entirely and head straight to Civic, but it looks like people from Crace travel everywhere. That said, it is difficult to tell from this map the concentration of people who travel to civic. I’m still pursuing actual numbers to give us a much clearer idea. Would you use a bus that avoided the marketplace and went straight to Civic? If so, would that bring you to the public transport system, or are you already a passenger? We would also be seeking a mirrored route in the evening peak hour, if the numbers supported it.